From a promotion for the space studies program at the International Space University. Photography courtesy of International Space University and used with permission. This is the first of two parts of a Global Voices interview with Juan de Dalmau, president of the International Space University (ISU). 2019 — space is no longer the final frontier, but already well and truly a realm for exploration and exploitation. According to the registry maintained by the United Nations Office on Outer Space Affairs, about 20,000 human-made objects are currently in orbit around the Earth, and a hundred more are orbiting other bodies of the solar system. Eighty nations, or supranational organizations, have launched their own satellites. Purposes of these satellites already cover a wide range of human activities: telecommunications, military surveillance of territories, prevention of natural disasters, scientific research, ecology, and more. 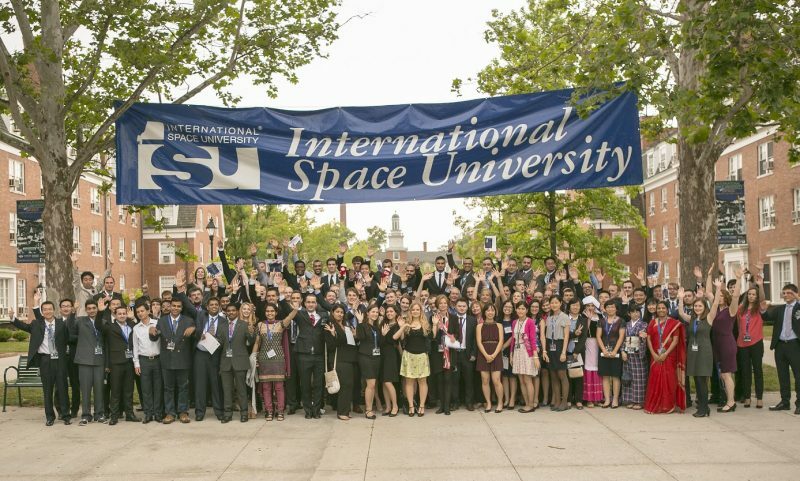 The International Space University (ISU) is a private university founded in 1987, the aim of which is to train future leaders in the exploration and development of space. Global Voices spoke with university president Juan de Dalmau on his efforts to continue his institution’s traditions of interdisciplinary and peaceful development. Global Voices: How did an American university decide to establish its main campus in Strasbourg, France? Juan de Dalmau (JdD) : This was actually decided by the results of a competition. The founders had already decided that the growth of the ISU would be accomplished through a central campus, paired with a network of collaboration with universities around the world. In the 1990s, a contest was launched to choose the city to host the central campus: Strasbourg was the winner, over other candidate cities from Canada, Japan, Italy, or other regions of France. In an initiative strongly supported by its mayor at that time, Catherine Trautmann, Strasbourg took on the task of constructing a building for the ISU, which would suit the criteria of the university, and for which the funding was already guaranteed. However, the university has also kept a significant presence in the United States, and thus, a rotating course program returns to the United States once every three or four years. Former students, and a collaborative network of companies in the aerospace industry, as well as NASA [National Air and Space Administration] sponsor courses, or send their collaborators to attend. GV: Where do your students come from? What do these future space leaders bring in their luggage? JdD: The master’s degree program in space studies [of 12 or 24 months of study] this year has a class of 45 students, who come from twenty different nations. They bring with them quite a variety of luggage. A bit less than half of the students have had a scientific or technical education, and the other half is more varied: economics, life sciences, medicine, management, architecture or teaching. From the beginning, the ISU decided to teach by creating connections between disciplines. That was the vision of the founders, who were at that time students in MIT [Massachusetts Institute of Technology]. A vision of multidisciplinary learning. The program is therefore designed to provide a general culture for everyone. Which is to say, engineers will have to attend basic engineering courses, but through which, they will also have to put themselves in the shoes of a lawyer, or an economist. And that has the additional advantage of putting everyone at the same level for practical work. For example, our students have to imagine missions for fleets of mini-satellites [cube-shaped space devices as small as 10 centimeters on a side] which can be used for sustainable development initiatives of the United Nations, designed for developing nations. Today, the International Space University has more than 4,600 former students, and of those, more than 80 percent are working in space industries. From ISU, they have taken with them in their luggage the versatility to work in many different ways, whether it be with other countries, disciplines, or ways of thinking. And in knowing how to find the right person in the right country, due to an informal but well-maintained professional network. Entities which were at first hesitant, or did not really believe in the ISU, are now the ones who come to us, and want to work with us. This development of our image and our reputation can be credited largely to the accomplishments of our former students. Thus, in September 2018, we signed a collaboration agreement with the European Commission, which they initiated, that allows us to propose internships to the Commission, to facilitate interventions by Commission officials, to give courses or to enter as participants. Or even to conduct joint space research projects as a tool for dialogue, international cooperation and diplomacy with non-member countries. G: What is the attitude of developing countries toward the conquest of space? Can the ISU ensure that they participate fully in the development of their nations through space? JdD: Space exploration has become much more democratic. A country like India immediately comes to mind, since India has developed its own space technology, without buying it abroad. It has built its own satellites, to monitor its territory in case of natural disasters, and to develop telecommunications in rural areas. GV: Are you talking about a development of the space industry outside any Cold War context or military application? JdD: Yes, quite so. We can do a lot of good with civilian satellite programs. More and more developing countries are investing in space technology and education, to avoid buying it. Mexico, Thailand, Nigeria, South Africa, Bolivia and Colombia are implementing programs to benefit their national quality of life. They do not want to “miss the train of space” because space ventures can become a source of well-being and a better quality of life. introduction between Global Voices and the International Space University. Editor Suzanne Lehn facilitated the interviews. The second part of the article will soon appear in Global Voices in coming days.